Has been an illustrator with Taddle Creek since about 2010. He illustrated the cartoon story “Errol Dynamic” by Cory McCallum with whom he curated Chilly Tales, an anthology of Canadian cartoonists. “Surrealtor.”. Writ., Cory McCallum. Monstrosity, v.2, 2014. Front: “Keep Low.” Taddle Creek, 38, Winter 2016-2017. “The Maze.” Writ., Jonarno Lawson. Taddle Creek, 33, Summer 2014: 18. “The Notapotamus.” Writ., Dennis Lee. Taddle Creek, 33, Summer 2014: 5. “I Ain’t Racist, But….” Writ., Friendly Rich. Taddle Creek, 33, Summer 2014: 16-17. “Architecture and Democracy.” Writ., Russell Smith. Taddle Creek, 38, Winter 2016-2017: 23. “Aurora Borealis.” Writ., Amy Jones. Taddle Creek, 38, Winter 2016-2017: 4-7. “Concrete Swans.” Writ., Suzette Mayr. Taddle Creek, 35, Summer 2015: 25. “Empathize Or Die.” Writ., Jessica Westhead. Taddle Creek, 37, Summer 2016: 5. “Endnotes.” Writ.” Alex Pugsley. Taddle Creek, 38, Winter 2016-2017: 11. “A Girl And A Dog On A Friday Night.” Taddle Creek, 38, Winter 2016-2017: 37. “Gnomes With Knives.” Writ., Lee Henderson. Taddle Creek, 39, Summer 2017: 5. “The Great And Powerful.” Writ., Lauren Carter. Taddle Creek, 35, Summer 2015: 11. “Here We Are, Charles.” Writ., Hal Niedzviecki. Taddle Creek, 34, Winter 2014-2015: 11. “Lindsay.” Writ., Andrew Daley. Taddle Creek, 37, Summer 2016: 39. “Money Changes Everything.” Writ., Shawn Syms. Taddle Creek, 37, Summer 2016: 11. “Moonman.” Writ., Sarah Meehan Sirk. Taddle Creek, 34, Winter 2014-2015: 35. “Name Withheld By Request.” Writ., Lana Pesch. Taddle Creek, 35, Summer 2015: 5. “Namesake.” Writ., Napatsi Folger. Taddle Creek, 39, Summer 2017: 20. “Only the Bear Surviveed.” Writ., Chris Kurata. Taddle Creek, 34, Winter 2014-2015; 44-46. “Progress On A Genetic Level.” Writ., Andrew MacDonald. Taddle Creek, 35, Summer 2015: 37. “Salmon Upstream.” Writ., Nicole Dixon. Taddle Creek, 39, Summer 2017: 33. “The Stink.” Writ., Jess Taylor. Taddle Creek, 37, Summer 2016: 33. “Visions.” Writ., Lisa Moore. Taddle Creek, 39, Summer 2017: 49. “Westfalia.” Writ., Cary Fagan. Taddle Creek, 34, Winter 2014-2015: 5. “Contributors.” Taddle Creek, 34, Winter 2014-2015; 2. 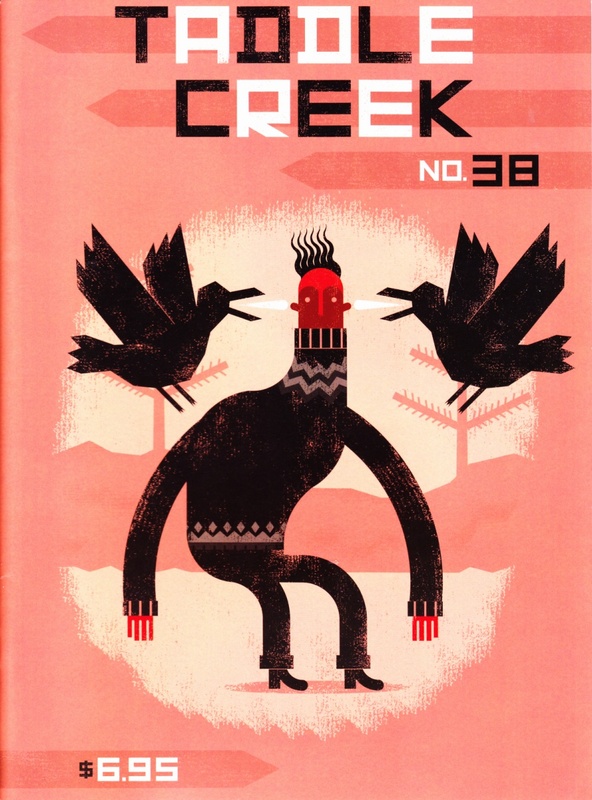 Taddle Creek, 38, Winter 2016/17: Front cover.